Cannabidiol/CBD is a natural constituent of Hemp Oil which contains wellness properties. New World Health Brands is committed to providing the best CBD oil in the market. For more information on product ingredients and supplements facts, by clicking the Ingredients and Supplements Facts sections above. 50% Shipping Discount at Checkout. Suggested use- Ingest 1mL one to two times daily. 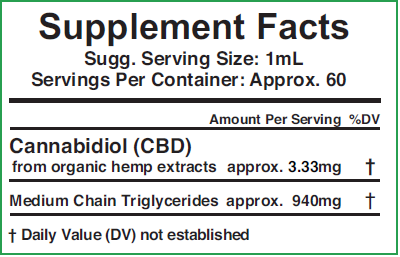 Each serving contains approximately 3mg of CBD. We carry natural flavored CBD products for those of you who might want to stay away from flavored products. See the Related Products section below.